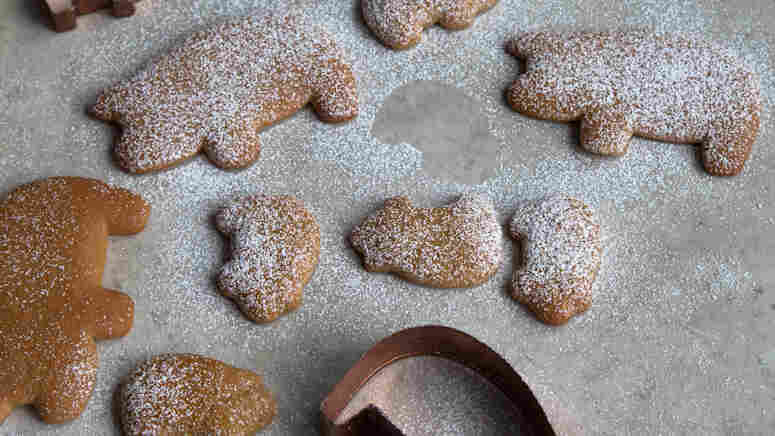 This Little Piggy Cookie Is A Sweet Mexican Find Mexico-born chef Pati Jinich spent years tracking down a recipe for the popular but elusive Piggy Cookies. Now the cinnamon-spiced treats are a staple in her house. A few years ago, Pati Jinich had never heard of Piggy Cookies. But after numerous recipe requests and a chance encounter with the treats in her home country, they've become a family favorite. Mexican Piggy Cookies are known by many names — cerditos, cochinitos, marranitos or puerquitos. Sweetened with unprocessed cane sugar and honey, and spiced with cinnamon, the cutout cookies puff when you bake them. A few years ago, Mexico-born chef Pati Jinich had never heard of them. But after numerous recipe requests and a chance encounter with the cookies in her home country, they've become a family favorite. She shared a recipe for piggy cookies for All Things Considered's Found Recipe series. 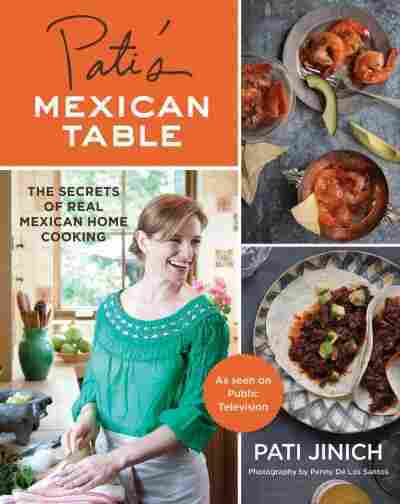 Jinich is the host of the PBS show Pati's Mexican Table, and has written a cookbook with the same name. The former political analyst is now a culinary ambassador of sorts for the Mexican Cultural Institute of Washington, D.C. Mexican expatriates like her — who are hungry for home — often ask her for regional recipes, and she does her best to comply. But piggy cookies left her stumped. "At first I was like, 'What on earth is a piggy cookie? I've never heard about a piggy cookie,' " she says. She started hunting for a recipe but came up short — none of her friends or relatives had heard of the cookies, either. Ultimately it was happenstance, not research, that brought the cookies into her life. While on a road trip from Mexico City to Jalisco, Jinich and her husband stopped at a gas station. While refueling, she noticed a woman sitting at a tiny stand nearby. "[She] seemed to be selling breads, little fluffy breads," she says. "And I walked to her, and what do I see? They're piggy-shaped! I was ecstatic." Jinich describes the cookies as a cross between a cookie and a sweet roll. "They just taste so sweet, in a mellow way, and comforting because they're so puffy and fluffy and like nothing I ever tasted before," she says. "But at the same time, it tasted to me like my home country." After the gas station, Jinich started noticing the cookies everywhere — not in big cities, but small towns. Still, she couldn't find a recipe. "Everybody cooks by eye; you add a little, you mix a little," she says. Once home, she set to work crafting a recipe. When she had it nailed down, she sent it to those expats who had requested it. "I got such beautiful emails back. Not only did it enrich my home and my family ... but it also brought me closer to my home country because I'm learning all these things I didn't know, and I'm trying all these recipes that I didn't know while I was there," she says. The only downside? Jinich, mother to three boys, now has to carefully calculate when she bakes the cookies. "I make it by myself when the boys are not at home, because they'll start devouring this dough," she says. If you cover them as soon as they cool, they will remain soft and fluffy for a while, but as the days go by, they will harden and have the snap of a traditional cookie. If you want them to harden faster, don't cover them. You can find pig-shaped cookie cutters online, or use any shape you like — but then, you need to change their name. 1. In a medium saucepan, combine the piloncillo, water, and cinnamon and bring to a simmer over medium heat. Lower the heat to medium-low and simmer for about 15 minutes, or until the piloncillo has dissolved and the liquid thickens to a light syrup. Turn off the heat and remove the cinnamon stick. Add the butter and honey and stir until they melt. 2. In a large bowl, whisk together the flour, baking powder, baking soda, and salt. Make a well in the center and pour in the piloncillo mixture. Mix with a rubber spatula until well combined. Add 2 of the eggs and stir until thoroughly mixed. The dough will be very sticky and gooey. 3. Place two long pieces of plastic wrap, one running horizontally and one vertically, in a medium bowl, letting the ends overhang the edges of the bowl. With a rubber spatula, scrape the dough onto the plastic wrap, then bring the edges of the wrap over the dough and secure tightly (leave the dough in the bowl). Refrigerate for at least 2 hours, or up to 2 days. 4. Preheat the oven to 375°F, with racks in the upper and lower thirds. Butter two cookie sheets. 5. Sprinkle flour on a work surface and a rolling pin. Cut the dough in half. Working with one piece at a time, roll out the dough about 1/4-inch thick. Using a 3-inch piggy cookie cutter, press straight down on the dough to cut out cookies, moving the cutter slightly on the work surface to make it easier to lift up the cookies. Gather the scraps into a ball and roll out again. Transfer the cookies to the prepared cookie sheets, spacing them about 1-inch apart. If the dough becomes too sticky, roll it into a ball, wrap it again in plastic wrap, and place it in the freezer for 5 to 10 minutes before rolling again. 6. Gently brush the cookie tops with the remaining egg. Bake in batches for 7 to 9 minutes, or until the cookies are puffed and golden on top. Remove from the oven and transfer to a cooling rack to cool completely. Sift confectioners' sugar on top of the cooled cookies, if desired. Excerpted from Pati's Mexican Table: The Secrets of Real Mexican Home Cooking by Pat Jinich. Copyright 2013 by Pat Jinich. Excerpted by permission of Houghton Mifflin Harcourt.